The Caped Crusader. The Boy Wonder. The Riddler. Two-Face. Dr. Chase Meridian. OK, that last one doesn’t quite fit with the others, but she’s still a part of the movie. 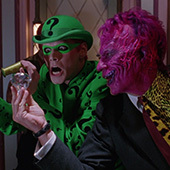 1995’s Batman Forever. 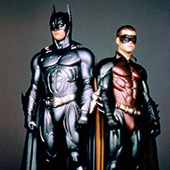 Joel Schumacher took over the reigns after Tim Burton’s departure and tried to bring the franchise back to a more “kid friendly” place. At times, it seems to imitate the old Adam West Batman show from the 60’s. Is that the right move for a Batman film? The guys discuss it this week in the new episode! Check it out below! Buckle your seat belts. 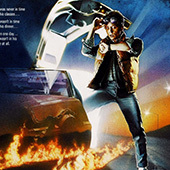 When this baby hits 88 miles per hour… Join the guys as they dive into a discussion on Back to the Future! Is it as perfect as they remember? Are there plot holes? Should Justin have to turn in his nerd card for forgetting Gene Roddenberry’s name? 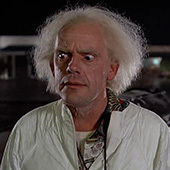 Travel back to 1955 with the guys and find out! Take a listen below. 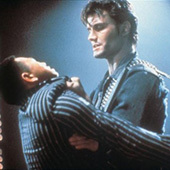 Five years after he battle Rocky and Apollo Creed in Rocky IV, Dolph Lundgren sets his sites on the mob. 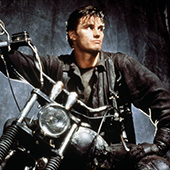 In Marvel’s first film based on The Punisher comics, Lundgren plays Frank Castle, an ex-cop whose family was murdered by the mob. Now he’s quit the force and become a vigilante, punishing the wicked. Unfortunately, this film has its issues. The guys explain what they liked and didn’t like about this version of The Punisher. Check it out below!